I’ve spent the last week thinking about the Big Three – the three things I have left to do before I will meet the challenge I set for myself when I started this blog on my fifty-ninth birthday. I promised myself I would make an art quilt, an art doll and a 16” x 20” painting before my sixtieth birthday, along with at least forty-seven other creative things over the course of the year. Last week, I was able to report that my List of Fifty Things was up to forty-nine, so it was time to get serious about the Big Three. I knew I should be working on one of them and I knew it wasn’t going to be the art doll or the art quilt. Those are sewing projects and I can’t get to my sewing supplies right now because my Temple of Creativity (a.k.a. Sewing Room) is still full of tie-dye bins. They get stacked almost to the ceiling in there at holiday time because we need the dining room for our celebrations. Normally, the bins would be back in the dining room by now, but we had a cold snap. As soon as we got the Christmas tree out of there, my husband brought in a whole lot of potted plants from outside, so there was still no room for tie-dye bins. If I was going to work on one of the Big Three, it was going to have to be the painting. Did I feel ready? Heck, no! I had materials but no skills. I had planned to get in a whole lot of practice during the year, so I could do something impressive for my official “Big Three” painting. That didn’t happen. Other things happened, including a lot of drawing, but every time I thought about trying to paint, I got scared. I was afraid my attempts would be lame and that would break my heart. Of course, first attempts are always lame – what else could they be? I knew that, but I still couldn’t make myself paint. I just kept reading about painting, as if I could learn to paint without actually picking up a brush. I started this week doing exactly the same thing – reading about painting. I have stacks of books and magazines about painting and I love reading them and imagining that I can paint. In my fantasies, I am a fabulous painter. In reality, I have a lot to learn. Still, I needed to come up with something to meet my challenge, so today, I painted. I was joined in this adventure by my older daughter, who is not the least bit afraid of painting. 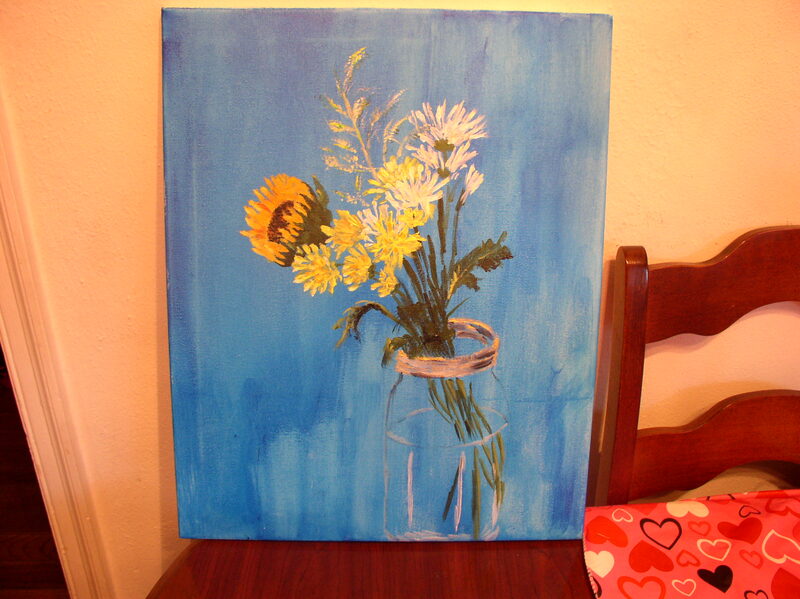 She helped me set up a small still life and then, well…then we picked up brushes and we painted. You know what? It was fun. I had a good time. It may be lame, but I learned a lot and I have met my 16” x 20” painting challenge. Hey, at least it’s not just a giant painting of a leaf. This entry was posted in Uncategorized and tagged creativity, painting, procrastination on January 10, 2014 by releaf1954. I love it! It’s really difficult getting the light right for glass. Great job. It is totally NOT lame! It’s a great, first painting! I wish we could paint together! Thank you. It would be great if we could paint together. It sure helped to have Mary here, painting with me. I might not have been able to keep going without that encouragement. I certainly hope you find more things to share with us after you’ve checked off your list… You are quite an inspiration! Thank you. I definitely intend to keep blogging — and, I hope, creating — after my sixtieth birthday. I’m feeling a lot more positive about my creativity now than when I started eleven months ago. The blog has been a great motivator.